RIGOL MSO7034 is a four-channel mixed signal digital oscilloscope with a bandwidth of 350 MHz and a maximum sampling rate of 10 GSa/s. It integrates an oscilloscope, a 16-channel logic analyzer, a dual channel arbitrary waveform generator, a digital voltmeter, a counter and totalizer, and a protocol analyzer. This compact lightweight digital oscilloscope provides exceptionally accurate waveform viewing and measurements. RIGOL MSO7034 provides up to 600 000 wfms/s waveform acquisition rate. 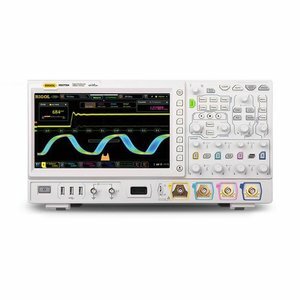 RIGOL MSO7034 digital oscilloscope is perfect for production tests, field service, research, design and all other applications involving analog/digital circuit tests and troubleshooting, as well as education and training. Real-time sample rate: 10 GSa/s. Vertical sensitivity range: 1 mV/div - 10 V/div. Digital Oscilloscope RIGOL MSO7034 — 1 pc. RP35000A passive probes (500 MHz) — 4 pcs. Logic analyzer probe — 1 pc. Front panel cover — 1 pc.